Oh the places you can go - when you have a kayak! There are some moments when the grace and subtle beauty of nature is better captured without a big, long lens - this is one of them. In Oklahoma City, you can try urban birding by kayak every Tuesday at Lake Hefner via the fantastic OKC Kayak. For the definitive source of kayaking in Oklahoma check out the Kayak Oklahoma blog. ...an absolutely gorgeous photo. Love the crisp white against the deep, rich green. Beautiful. She's a beauty against all those trees and limbs. She seems peaceful hidden away from the everyday. Hope all is well. Have a great day. Great capture, love those long-legged wading birds! Thanks for the Oklahoma Road trips link, too. Hope to see you on the water sometime! You have a great eye, Tim. The bird stands out so clearly against the green. Very pretty. I love Egrets and the color is beautiful. Beautiful photography, and you storm pictures at prairie are great. I like the white bird against those trees - and certainly agree that kayaking gets you up close to birds. So, so so glad you coould get out and enjoy the water. I picture you gliding around a quiet cove, handy camera capturing those rare moments. Such a great way to spend time--and thank you for passing your discoveries along to us! Wonderful. I had never heard of kayaking on Lake Hefner. Kayaking and canoeing must be the best way to see water birds up close T.R. I am trying to get together with my brother to go down the Sacramento River in his canoe on a bird photography excursion. What an excellent photo of the Great Egret out on a limb. Make sure you click on it to get the full effect. I love getting out in a boat..great in areas like that! Beautiful photo of the Egret kayaking is the way to go. The Egrets are so showy against a dark background. Nice shot. Beautiful shot, TR! I haven't been kayaking since college, but what fun it always was. I can't believe you get to do it on a weekly basis. And it looks like you've got a wonderful place to enjoy the water! TR, this sound like it is right up my ally! My how that white bird stands out against all of that green. Definately NOT camoflage! This bird is a stand out and a show off! 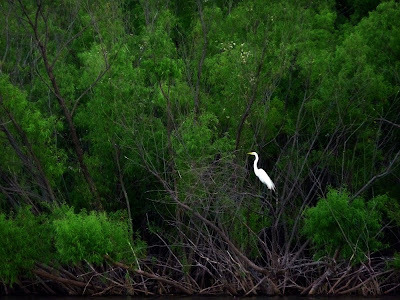 Spectacular image with the white of the Egret standing out against the darker foliage. Yes, a shot best taken without the long lense. Arresting image. Less is more, right? Your photos always seem so effortless, but I know that several decades' worth of practice go into that grace. Thanks for the tip on kayaking in O.K. It looks like a lovely vacation to me.